My inquiry into the future of god will sound strange – and probably blasphemous – to believers who regard him as an immortal being, beyond the world and outside of time, without beginning or end. That’s how Christian orthodoxy defines god at any rate. There can be no ‘future’ for such a timeless and unchanging metaphysical absolute. But then again, I’m not talking about the god of theologians – referring to those who talk about god and make a living putting definition around a mystery that cannot be named. Long before the theologians were mystics and storytellers, who rather than making the mystery into an object of thought, sought its direct experience (the mystics) or mediated through the veil of metaphor (the storytellers). The contribution of theologians was to detach from the mystery and turn it into an object of thought – something separate from the mind and its immediate experience. Direct experience gave way to metaphorical depiction, which eventually lost its transparency and finally condensed into a separate thing – god as a being possessed of certain powers and attributes. Whereas god had earlier been acknowledged as representing the creative ground and abyssal depths of being itself, his identity as a character of story was later relocated to the objective realm where he became the god of theologians. This mystery is indeed timeless – or eternal, according to the original meaning of that word. Our experience of mystery is ineffable (i.e., indescribable, unspeakable, beyond words) since it transpires far below (and was felt long before) the active language centers of the brain. To translate the experience of mystery into language – into names, nouns, adjectives and verbs – is to move out of experience and away from the mystery. As a product of human imagination and language, the objective god of theologians is the principal artifact of religion. It has a past, and we can legitimately ask whether it has a future. To give my answer to that question, it’s necessary to see religion and its god in historical context. The construct of god hasn’t always been with us – in fact, in the longer run of our evolution as a species, the concept of deity is a late arrival. For many millenniums the human experience of, and response to, the present mystery of reality was carried in the thought-forms of animism. This mode of reflection was – and still is, particularly when we are very young children – deeply in touch with the urgencies and rhythms of the body, and the profound ways this embodied life-force connects with, depends on, and participates in the rhythms and cycles of nature all around. Our bodies, other animals, the trees, the seasons, Sun, moon, and stars are animated (made alive and moved) by forces we cannot control or understand. Over time human curiosity, imagination, and technical ingenuity began to thicken the layer of culture mediating our experience of nature and the mystery of life. Symbols preserved the connection but were themselves symptoms of our growing separation. Mythic narratives weaved patterns of meaning and tribal ceremonies provided for social engagement, keeping the community synchronized with the great rounds of natural time. A crucial advancement also came with the concept of a higher purpose behind things – no doubt reflecting the way that the programs and techniques informing human culture are directed by our own strategic objectives and desired outcomes. Everything happening was hereafter regarded as happening for a reason – not so much according to an antecedent causality (a line of reasoning that would eventually inspire the rise of science) but by fulfilling the aims of a transcendent will – the god(s) of theism. The narrative invention and developmental career of deity is a primary feature of the type of religion known as theism. Historically this career moves through three distinct phases. An early phase charts a time when the layer of culture is still thin enough to be subordinate to the life forces of nature. A deity serves as provider of the resources a society requires, as well as of the protections that shelter it from natural catastrophes. 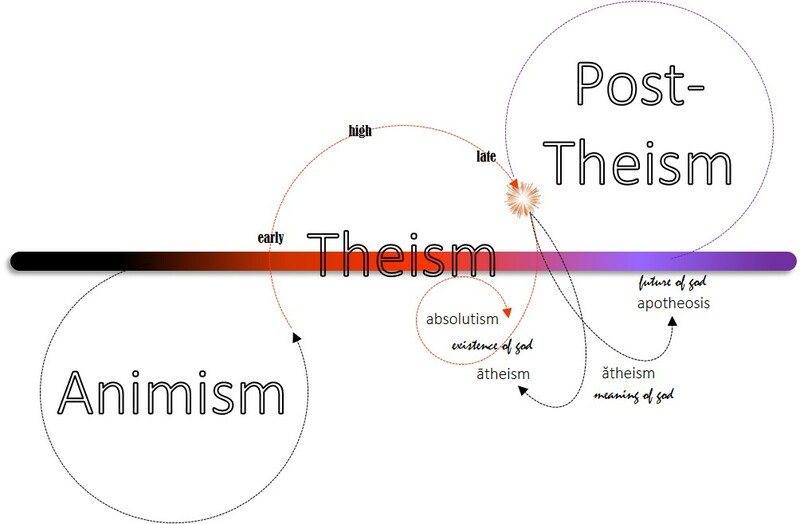 In theism’s high phase, the thickening of culture correlates also to the formation of ego, to that social construction of personal identity each of us knows as “I, myself.” As its counterpart and transcendent ideal, a deity authorizes a morality of obedience and personifies the higher virtues of ethical life. God is to be honored, worshiped, and obeyed. In doing so, individual egos are motivated to conform to social norms, as they strive to please the deity and gain his (or her) favor. Late theism marks a transition where the deity is invoked less in sanctuaries than contemplated in the depths of the soul. A transactional morality of obedience – be good and god will be good to you – gives way to a more adult aspirational morality. Those divine virtues which had been elevated and glorified in worship become the internalized ideals of a more self-responsible, compassionate, and benevolent way of life. An inherent (and building) tension in late theism has to do with the fact that its tradition, liturgy, and orthodoxy remain focused on an objective god, just as the orientation of many believers is starting to shift to a mystically inward and ethically engaged spirituality. So far, then, we can observe an advancing focus in religion, invested early in the sentient experience of our body and the rhythms of natural life (animism); then graduating upwards, so to speak, with concerns related to ego formation, becoming somebody, finding one’s place in society and striving to be a good person. Theism might be thought of as a ‘second womb’, providing the social support, cultural instruction, and moral incentives for the development of personal identity. In my diagram I have placed the graphic of a burst to represent the moment when we ‘see through’ the veil of our myths and symbols. This insight may be experienced as an epiphany (an “appearing through”) or more like an apocalypse leaving us utterly disillusioned – that is to say, where the illusion of those sacred fictions and orthodox beliefs that had for so long nurtured the formation of our identity is ripped from its rings like a great curtain coming down. In some religious traditions this is represented as the labor pains of a second birth, of being lifted out of the warm trance of social conformity and into our creative authority as agents of a higher wholeness. Four possible paths lead from this point. Two of them, named absolutism and ātheism (with the macron long ‘a’), stay fixated on the question of literal truth. Is the featured deity of those sacred stories a literal being, a supernatural or metaphysical personality out there and separate from us – a supreme being among beings? Absolutism (aka fundamentalism) has to say ‘yes’ unless everything is lost. Ātheism says emphatically ‘no’, since a literal god in that sense is contradicted by science, besides being logically incredible and an offense to our ethical freedom as humans. These paths, then, don’t really lead anywhere because they both remain stuck on god. A third path, opening into a fourth, seeks to better understand what god means rather than argue for or against his literal existence. As a literary figure (i.e., a principal character of myth) the deity serves a purpose – the ones identified above: representing a provident purpose behind things (early theism), authorizing a moral system (high theism), and exemplifying the higher virtues of a liberated life (late theism). The commitment to understanding (i.e., seeing through) what god means rather than debating his existence is what distinguishes ătheism (with the breve ‘a’, as in “apple”) from simple ātheism. The present mystery upon which the whole enterprise of religion has been a contemplation – from the embodied experience of sentient life (animism) to the heroic adventure of self-conscious identity (theism) – now prepares to transcend merely personal concerns for a universal truth, that All is One. The advent of our awakening to the full capacity and higher potential of our human nature is what I mean by apotheosis. This is the future of god. How ought we to live, in view of this higher wholeness and our place in it? According to post-theism, we devote ourselves to the provident care of our resident animists (infants and young children). We exemplify the virtues of community life and inspire our resident theists (children and adolescents) to follow our example. And when their minds and hearts are ready, we encourage them to step through the veil and join us in this work, on the other side of god. The big money in mental health research goes toward the problems and disorders that interfere with normal functioning, personal happiness, and human fulfillment. Volumes of theories, diagnostic manuals, and expensive interventions are devoted to correcting what’s wrong with us, or, if the cause is unknown, at least relieving the symptoms of our suffering. Critics have noted that the conventional notion of a mental “disorder” is problematic in that it presupposes something (mental “order”) of which we have no clear understanding. This leaves the market open for a proliferation of so-called disorders – as many as need to be invented – and their matching medications. In numerous posts I have worked at correcting this widespread but erroneous characterization of spirituality. For sure, there’s a lot of metaphysical malarkey out there, and good people have fallen for it again and again. Angelic visitations, divine revelations, psychic readings, and miraculous powers are found in sacred myths, folk tales, and personal testimonies around the world, but such things shouldn’t be confused with spirituality. They are adornments of religion, not its true essence. As a symbol system and way of life, religion might be organized around such mythical characters and events, but its primary function is in providing social structure for the expression of a deeply interior experience. Now, it might sound as if I’m thinking of this deeply interior experience as something esoteric, in the sense of secrets kept hidden from the uninitiated and simple-minded by those who really know the truth. Typically this secret knowledge involves the translation of popular myths and symbols into a vocabulary of metaphysical abstractions protected by an occult tradition of rituals, creeds, and hierarchies of authority. Esoteric religion is thus an underground version of what’s going on at the surface of conventional society, but with the veil of ignorance purportedly removed. It’s not really a deeply interior experience at all, just another kind of religion carried on by an elite few. What I mean by spirituality has nothing to do with supernatural realities, metaphysical realms, or secret knowledge. It is the deeply interior experience of being human: of existing, striving, and becoming fully human, more fully alive. Genuine and true religion is the structural expression of this adventure in the life of society, linking the individual ego inwardly to its own grounding mystery, across the social synapses of community life, and outwardly to the turning mystery of the universe. In its better days, religion facilitates the progress of spirituality and our construction of meaning. At its worst, it blocks progress and even represses the creative spirit. Unfortunately, many have identified religion with its degenerate forms and historical periods of corruption, concluding that we are better off without it. In the beginning – and I’m using that phrase for its resonance with Creation myths – we were carried in the dark waters of our mother’s womb and eventually delivered through a narrow passage into another dimension. We were vulnerable and dependent, relying on her (or her surrogates) for the satisfaction of our every need. In the nursing embrace we gained a base of security, and her supervising care instilled in us a sense of reality as resourceful and responsive – in a word, as provident. This is also the earliest, and deepest, stage of spirituality. To some greater or lesser degree, all of us have (and continuously seek) this experience, which is named faith. It’s critically important that we distinguish such an existential faith – this open trust and absolute surrender to reality – from the catalog of beliefs that any given religion might regard as orthodox (“correct opinion”). Faith in those first days and early years of life was indeed closely associated, if not identified, with the existence of our higher (or taller) power. This may explain why existential faith, as I have described it, is frequently confused with belief in the existence of god. What we carry with us from that primordial experience is not a set of opinions, orthodox or otherwise, but again a deep interior sense that we are supported in a provident reality. Our ability to relax, trust, release, and open up to What Is will continue to influence everything about our life going forward. Without faith we are groundless, without a sense of support, cut loose and adrift in an absurd and uncaring universe. This isn’t something that religion itself can give, but religion will tend to translate the dominant or majority experience of its members into a more general worldview and way of life. By cultivating a community that is more grounded and intentional in its care for the very young, religion can foster the activation of faith in all its members. My diagram suggests chronological markers that define the time periods and developmental thresholds of spirituality. This earliest stage, from prenatal life to the end of the first decade, is what I’ll call the Age of Faith. The prominent themes of spirituality here are grounding, providence, security, trust, and openness to reality. From roughly age 10 to 25 is the second critical period of spirituality, the Age of Passion. This is when our openness to reality involves us in exploration, experimentation, and discovery. It’s also the age when the social construction of our identity undergoes significant trials and temptations. If we’re tracking along with world mythology, then this marks our Exile from the Garden of protection and infantile dependency, to the desert of self-conscious isolation and the jungle of sexual urgency. From here we might look back at what we lost and wish for it again, which is how some religions frame the challenge. Whether it’s by a method of ego glorification or ego renunciation, the solution in either case exposes a fixation of this period on the separate center of personal identity. Everything seems to turn around our needs and desires. In calling this period the Age of Passion, I am acknowledging the natural and very healthy way that consciousness regards all of reality as “staring at me,” as “judging me” and “making me feel” one way or another. While the word passion might have connotations of an extroverted drive for excitement, its root definition has to do with undergoing something, being “done to,” and suffering as a patient who is passive (“hold still!”) under treatment. 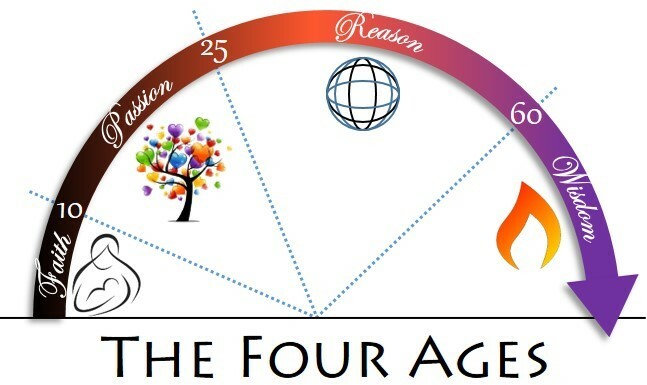 After 25 and until we’re about 60 years old spirituality progresses through the Age of Reason. This is typically when we are finishing our qualifications for a career and starting a serious job, finding a life partner and managing a family. By design, it is the time of Conquest and Settlement, when we take creative authority in making meaning, clarify a life purpose for ourselves, and expand our horizon of influence. Faith and Passion continue to give us grounding and make life interesting, but it becomes increasingly important that our place in the greater scheme of things is relevant and contributes value to the system(s) in which we belong. This is the time in our development when, in the interest of intellectual integrity and rational meaning, many of us step out of organized religion to work out for ourselves a personal philosophy of life. Religions don’t help when they intimidate us and condemn our quest for relevance as jeopardizing our place in the community or, worse still, in heaven after we die. But the logical coherence, theoretical integrity, and practical application of meaning is not at all the acid or opposite of a passionate faith – although it does have exactly this effect on a belief system (orthodoxy) based in outdated models of reality and antiquated moral standards. Any belief system that is not rational, reality-oriented, and relevant to our times should either be reinterpreted, remodeled, or set aside. There comes a time, however, when our most cherished constructs of identity and meaning need to open, like parting veils, to the present mystery of reality. In other posts I have characterized this threshold between the Age of Reason and the Age of Wisdom as bringing about an Apocalypse – a collapse of our world, a burning away of the canopy we had erected over ourselves for security, orientation, and significance. The timing of our disillusionment with the years when we are starting to disengage from the consensus trance of school, career, parenting, and managing a household is probably no accident. Just as the carousel is winding down, our inner spirit is ready to drop out. By ‘dropping out’ I really mean dropping in – out of the illusion of our separate existence and deeper into the present mystery of reality, into the Real Presence of mystery. Wisdom is not a function of accumulating knowledge, but is rather the breakthrough realization that nothing is separate from everything else, that All is One, and that We’re All in This Together. Oneness is not a matter of intellectually comprehending the totality of all facts, but of intuitively understanding that facts and thoughts, self and universe, the grounding mystery within us and the turning mystery all around us, are one reality. What we do to the Whole, we do to ourselves. What we do to our neighbor, we do to ourselves. We are not separate from the rest. We are one. Welcome to the Age of Wisdom.